Its thought that kites were first introduced into Japan by Buddhist missionaries who travelled from China in the Nara period (649-794 AD) and were mainly used in religious and thanks giving ceremonies. A Japanese dictionary dated 981 AD was the first to record the Japanese word for kite and used the characters for "Kami Tobi" meaning paper hawk - which suggests that the first kites were bird shaped. The Japanese absorbed much of the Chinese culture but they developed their own distinctive kite designs and traditions. They were used from earliest times for practical purposes such as in the construction of many shrines and temples in Japan where large kites were used to lift tiles and other materials up to workers on the roof tops. An early example of man-carrrying was told of a 12th Century warrior Minamoto-no-Tametomo who was exiled to an island along with his son and saddened by his son's lonely existence constructed a large kite on which he made his escape to the mainland. A Japanese thief used a man-carrying kite to steal the gold scales from an ornamental dolphin on the roof of the Castle of Nagoya and was only caught because he bragged of his daring deed. He and his family were boiled in oil. It was in the Edo period 1603 - 1867 when Japan was closed to all foreigners that most of the beautiful Japanese kites we know today were developed. 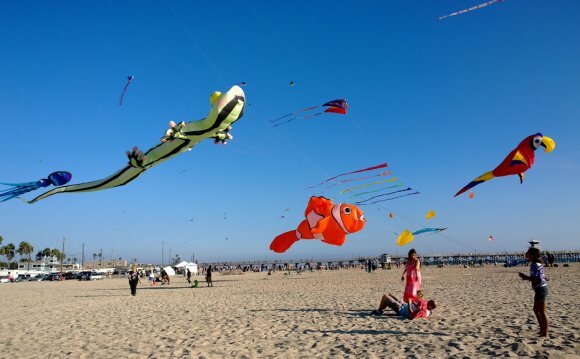 There are about 130 different styles and types of kites, each region having its own unique shape. They are normally decorated with characters from Japanese folklore, mythology or have some religious or symbolic meaning. All are painted with bright coloured natural dyes, sumi (black ink) and constructed from washi paper (hand made paper) and bamboo or where bamboo if difficult to grow cypress wood is used instead. The bamboo frame is called the bones and the paper covering is known as the skin. The popular name now for a Japanese kite is Tako - thought to be a play on the name - Tokyo where kites were very popular. The Japanese even have a word in their vocabulary "Tako-Kichi" which means, "kite crazy". which means wind and which means piece of cloth. Traditionally kites are flown on boy's day May 5th, (the 5th day of the 5th month) at religious festivals, public holidays and New Year. At Harvest Festival kites are flown with stalks of rice attached as a symbolic offering of thanks for a good crop. Others are decorated with the face of a demon and would act as a talisman against evil. One of the most famous kite festivals is Hamamatsu where kite teams battle against each other whilst over 2, 000, 000 spectators look on. Congratulation kites are still given to first born sons. Kites with paintings of folk heros or gods are believed to protect and guide the new-born child into adulthood, Fukusuke the large headed dwarf will bring good luck and some carry long life symbols such as the crane or tortoise, The most popular design is Kinorta - a small boy who was left by his parents in a mountain forest and raised by bears - he grew up to be wise and very strong. Kinorta is often painted with a carp, another symbol of strength and bravery because the carp must swim up stream against the current to lay its eggs.